Although he has recorded as sideman for the imprint since 2004 appearing on Paul Motian’s Garden of Eden set and also with the Polish trumpeter Tomasz Stanko on Dark Eyes in 2009, this is the guitarist’s debut album as leader for ECM. 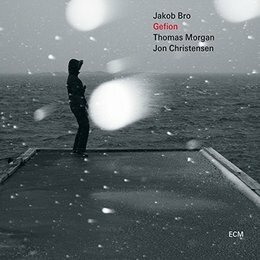 For this Bro has formed a trio with ECM veteran Jon Christensen on drums and the US bassist of the moment, Thomas Morgan. Morgan is rapidly proving himself to be a versatile musician at home in many contexts, with appearances on ECM recently with pianists Craig Taborn and David Virelles, and with the John Abercrombie Quartet. With the track record of all three members of the group it is not unreasonable for expectations to be high, but one cannot escape the feeling that perhaps Bro may have missed the boat somewhat. There is nothing inherently wrong with the album, and as whole sits comfortably within the chosen idiomatic framework of Bro’s compositions, and I for one would have expected more variety. For the most part, the melodies float gently above the chords, and the main events and point of interest come from the bass and drums either in their combined commentary or occasional attempts to shake things up a little. This they do most successfully on the bass driven ‘And They All Came Marching Out Of The Woods’, but all too often the guitarist seems consent to sit back and play very much in, as opposed for, the moment. And so with the exception of the aforementioned track, the other seven pieces steer their own gentle course. All have attractive melodic threads, but nothing really happens to grab your attention, and at the end of the disc the feeling is of having spent a pleasant enough forty minutes or so, but with the exception of Thomas Morgan and Jon Christensen’s colourations, there is little else to mark the passing of time.